One of our new year’s resolution in 2017 is to be more consistent in blogging (at least fortnightly) unlike last November and December. 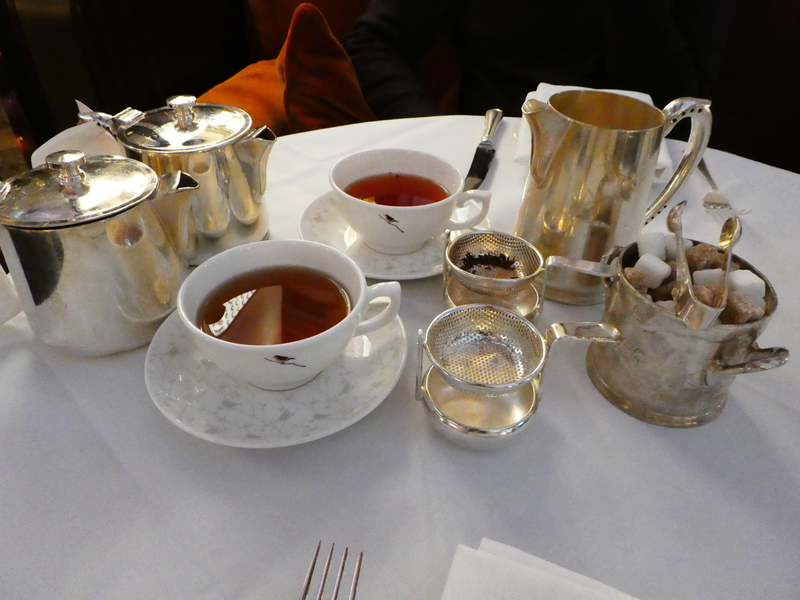 Over the Christmas bank holiday weekend, we decided to go for a little shopping spree and a nice afternoon tea in The Palm Court at Sheraton Grand London Park Lane, located only 5 minutes away from Green Park station (Zone 1, Piccadilly, Victoria, and Jubilee line). On our way to the hotel so many tourists were walking pass simply to walk around and take pictures of the area, or heading towards Winter Wonderland which ended on the 2nd January 2017. Needless to say, the hotel entrance and the atmosphere of The Palm Court built in 1927 was GRAND. With a professional harpist playing her classical repertoire, and the interior takes you back in time to the prosperity of late 1920’s London. After handing our coats to the doorman who greeted us with warm and friendly smile, we were ushered to our table by the server whom handed the menu to us to select our tea choices. Ayran was excited to select Velvety Rooibos Caramel tea as he often drink Rooibos tea from when he was back in South Africa. Sofia on the other hand selected Passion Fruit Ceylon originated from the hill sides in Sri Lanka. The server also asked if we wanted to have a vegetarian or regular Birdcage Afternoon Tea, and if either of us have any special dietary requirement. The name ‘Birdcage’ or the nickname given by Sir Bracewell Smith in the 1920’s was inspired from the ground building technique he applied to design the construction of Palm Court from whereby a birdcage-like steel structure was invented to be used as the building scaffold. The three-tier afternoon tea set arrived only a few minutes after. Without doubt, the presentation of the meal and the taste of all of the sandwiches, scones, and pastries were magnificent. Unlike the regular Birdcage, Afternoon Tea set menu, because we came during the Christmas season, one of the sandwiches was changed to turkey sandwich instead of the regular honey roasted ham with celeriac & mustard rémoulade on beetroot bread. Not only that, you are allowed to ‘refill’ any tiers within 90 minutes and this is also applicable for your tea and bottomless champagne for those of you who have opted for bubbly afternoon tea. The Birdcage Afternoon Tea menu can be found their website, and as you can tell The Palm Court offers a selection of champagne, wine, and classic or exotic herbal tea. The afternoon tea prices start from 37.00 for classic tea and 42.00 for rare & single estate tea.